In 1946, Branch Rickey (Harrison Ford) signed Jackie Robinson (Chadwick Boseman) to the Brooklyn Dodgers, breaking MLB's infamous color line and forever changing history. 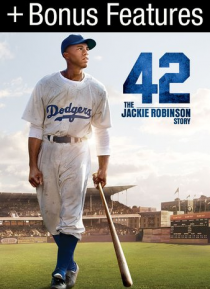 Plus, get these two bonus features only when you buy 42 - The Jackie Robinson Story! STEPPING INTO HISTORY features Harrison Ford and Chadwick Boseman, who discuss the challenges and rewards of playing two titans of American Hist… ory, Branch Rickey and Jackie Robinson. In FULL CONTACT BASEBALL travel to training camp with the actors who played the Brooklyn Dodgers.